David Young talks with a customer in his shoe repair shop, Wednesday Nov. 23, 2016. (Photo by Norm Shafer). 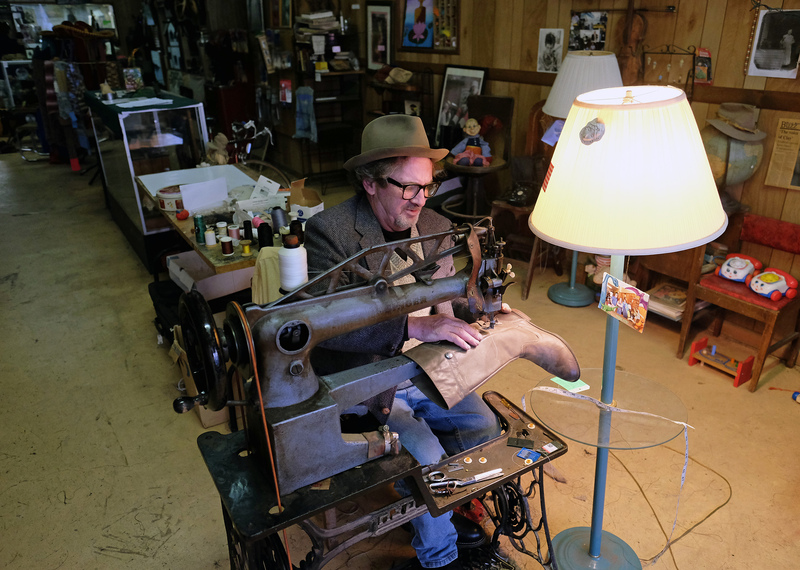 David Young sews a boot on an old Singer treadle sewing machine. (Photo by Norm Shafer). In an industry that has a long history of apprenticeship, Dave learned fast. He worked, he apprenticed, he read many old books, and he also taught himself. Speaking of the many stitches he uses today, he adds “I do not always know if they are historically correct. I know that they work.” Four years after he walked in the front door, Dave bought the business. Jerome West works on a pair of shoes at Graham’s Shoe Service. (Photo by Norm Shafer). 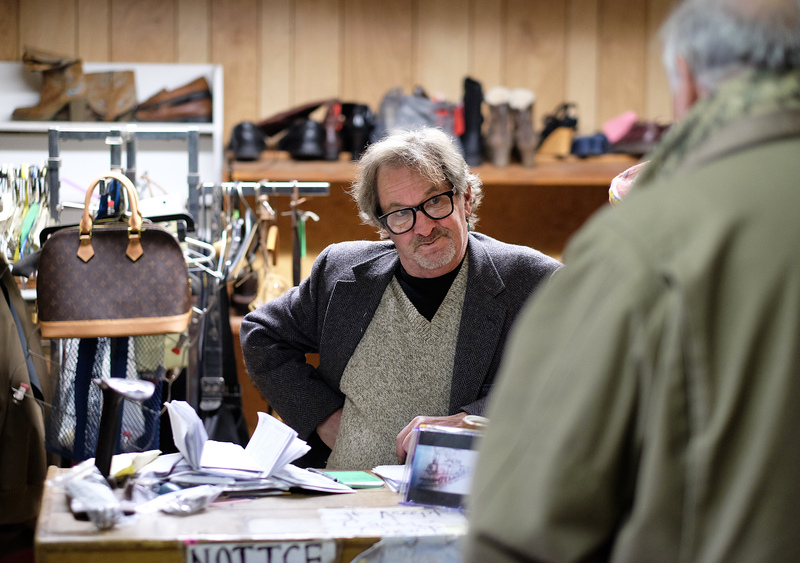 Graham’s Shoe Service has built its business by combining the warm familiarity of the local with the draw of the unique. Uniting century-old tools with the technology of the 21st century allows the store to lure customers from all over the country. Meanwhile, tattered boots shuffle in hikers who have walked from Georgia to Dave’s door. Acclaimed on the Appalachian Trail, Graham’s Shoes Service has always been a friend to the hikers. He knows them by their trail names and keeps a sign-in log that is decades old. He tells them that if he doesn’t receive a postcard from the summit of Mt. Katahdin in Maine, he will assume they did not finish the trail. His walls are littered with photos his admirers have returned. David Young locks up Graham’s Shoe Service for the night. (Photo by Norm Shafer). 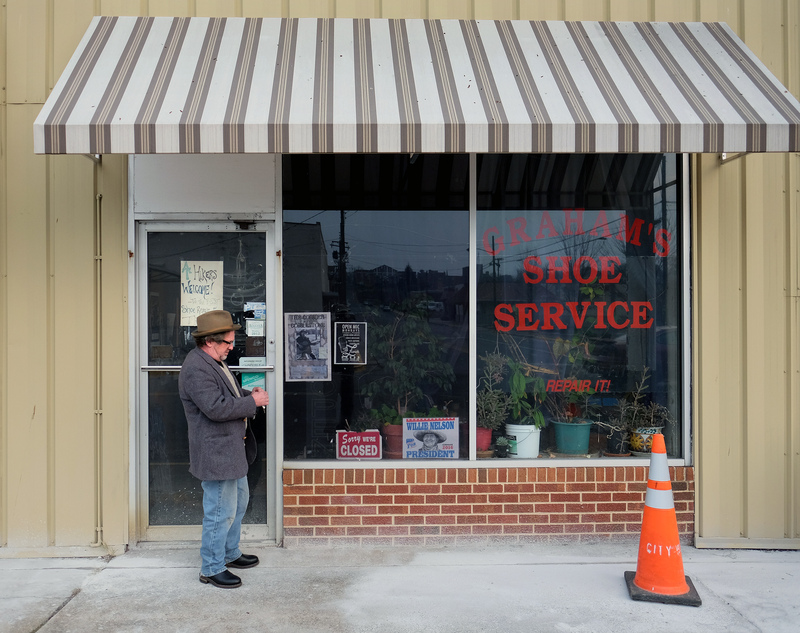 Indeed, strong women seem to anchor Graham’s Shoe Service, from the poster-size photo of Dave’s daughter in the back of the store, to the wooden wheelchair of his Great Aunt Clara, which graces the shop’s main entrance. She never walked as an adult, but Clara was nonetheless, independent, unmarried, and upwardly mobile at a time when few economic opportunities existed for women, even for the more physically nimble. Her legacy as a businesswomen stands as inspiration for Dave’s entrepreneurship and persistence. While he could never fix a pair of shoes for her to walk in, orthopedic risers and shoe supports for the aging have become a specialty of Graham’s Shoe Service today. 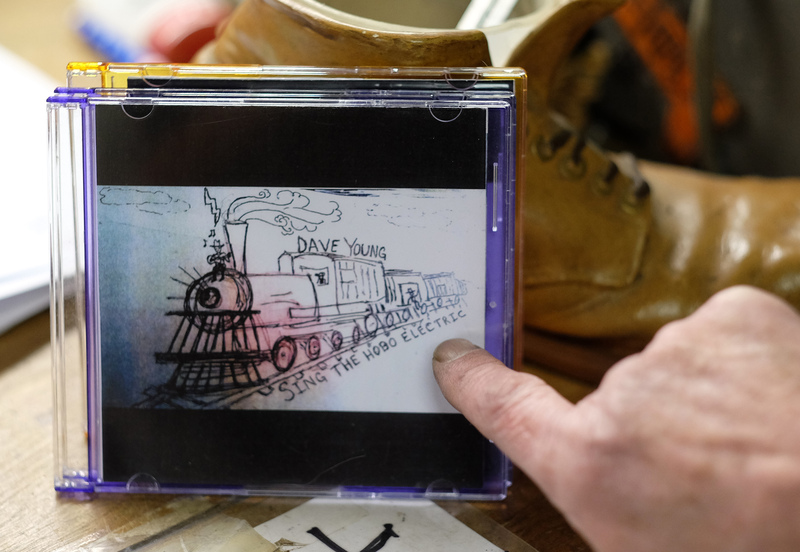 David Young of Graham’s Shoe Service talks about one of his music CDs. (Photo by Norm Shafer). To learn more about Dave, Graham’s Shoes Service, and Duffy the Singing Cobbler, you can visit him online at www.GrahamsShoeService.com. 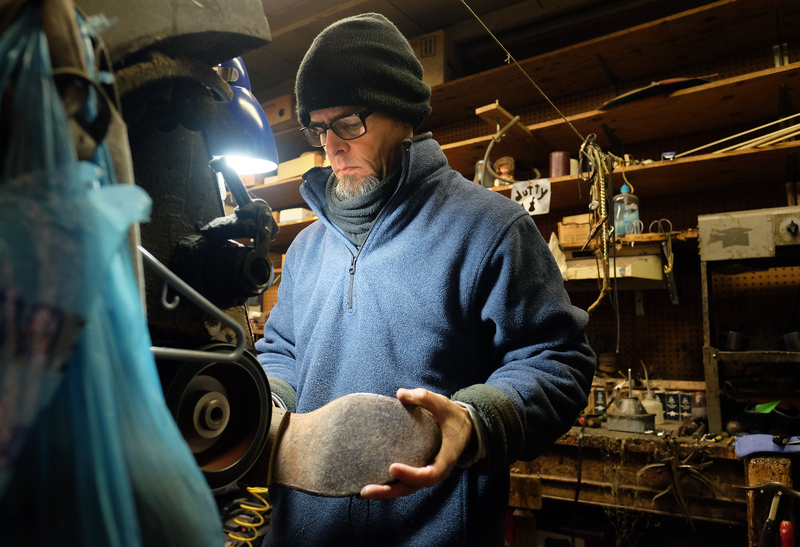 And, always check back often at GrowWaynesboro.com for new profiles of the local entrepreneurs who, like Dave, are building a more beautiful Waynesboro.